As the dawn of the electric car continues to gather even more pace, we are forced to accept the technology and the green credentials, or face years of burning to a crisp as our planet slowly heats up. That’s what the scientists will have you believe anyway, and while they are very clever, that doesn’t mean we should listen to them. The fact is, we all need cars that are usable every day. And up until very recently, electric cars just haven’t been good enough. Now, though, we’re beginning to see the electric car with added testosterone. Electric cars with power! Sit back and marvel at the quiet performance of the supercars of the electric world. Back in the day, electric cars were a joke. They had the range of Rick Waller and the looks of the Elephant Man. Nobody respected, loved or wanted one. But then we were told that the world was close to death and that we had to accept alternative fuels and propulsion for our cars – and so we listened. It took a few years, but now, with the manufacturers actually up for it, we can all go out and buy properly viable electric cars and help save the world. Most mainstream electrics like the LEAF and i-Miev (or whatever it’s called) are painfully boring, ridiculously over-priced and, above all, slow. 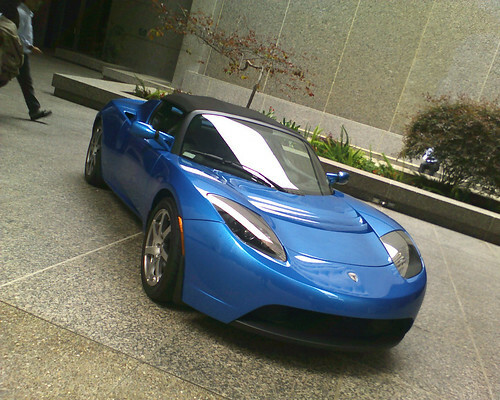 This was all solved, however, when a small company in America called Tesla gave us the Roadster. This small sports car featured the good looks of any sporty coupe but with the added green ‘I’m saving the planet’ electric motor. It is bloody quick, too; with a 0-62mph time of just 3.9 seconds, it beats most 911s and most old Ferraris. Ok, so the top speed isn’t 190mph – or even 130mph – but the instant acceleration is so intoxicating that you can’t help but fall in love with the Tesla. There are a couple of problems, though, and they come in the shape of money. The Tesla costs around $90,000 – or the same as a V8-powered Audi R8. So it seems that the Roadster is destined to be a celebrity tool to take onto chat shows and prove how green they are – even though they have a Pontiac GTO in the garage, too. You’ll have problem of seen the Hennessey Venom GT over the past year or so. It’s basically a Lotus Exige that Hennessey buy and then they fit it with the engine from a nuclear submarine and Bob’s your uncle; you’ve got a Veyron-worrying supercar – just like that. Well, the Wrightspeed X1 uses the same notion of using somebody else’s body but putting their own twist on it. 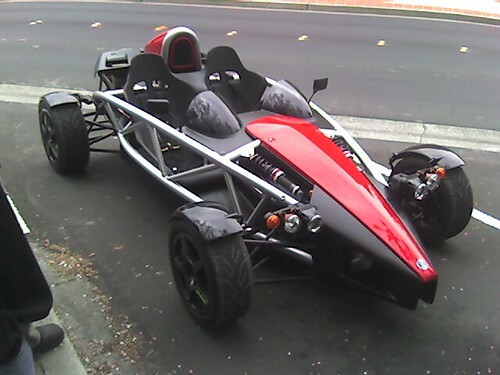 What Wrightspeed do is take the body from an Ariel Atom and fit it with some electric motors to create one quick supercar. A 0-62mph time of 3.07 seconds is enough to worry the standard 300bhp Ariel Atom – with a petrol engine – and it proves that with the right technology, electric can be fun and mind-blowingly fast, too! Shelby is a company based in America, and while they might not be too well-known over in the UK, they are very well respected in the states. That’s thanks mainly to their first supercar effort, the Ultimate Aero. It managed to take the top speed world record off the Bugatti Veyron in 2006, which was an impressive feat that few imagined the small company would be able to achieve. A few years ago, however, they announced a new variation of the Ultimate Aero dubbed the EV. It would be an electric version of the Aero and it promised biblical performance with the green economy of an electric. With 1000bhp and 800lb-ft of torque on tap, it’s not surprising that this is the fastest electric production car on the planet. Shelby has recently announced a new car called the Tuatara, and it wouldn’t be unlikely if they did the whole EV treatment on this supercar, too. Built by Dennis Berube, the Smoke Screen is classed as the fastest street-legal electric car in the world. It has managed to do a standing ¼ mile in just 11.083 @ 120mph, and as if that was enough, it can hit 62mph in less than 3 seconds. The heavily-modified Chevy S-10 has broken record after record, and it goes to prove that you don’t need billions of pounds in research and development to create a usable electric vehicle that can also destroy basically anything else on the road. Men in sheds; it’s the way forward! This article was put together with the help of Netcars.com, the UK used cars comparison website.